The United Nation’s Sustainable Development Goals include a specific target for full and productive employment. However, what constitutes full employment in developing countries is not yet clearly understood. And likewise, there is no clear direction for developing strategies and policies to address this challenge. 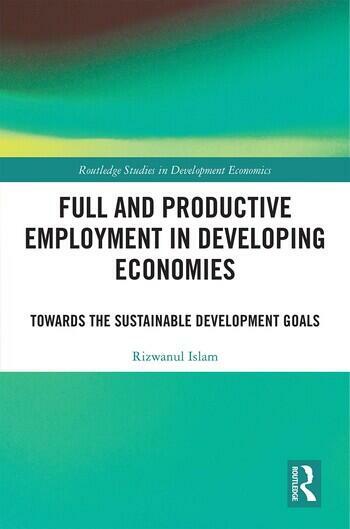 Drawing on the author’s deep knowledge of employment and inclusive development, this book presents a broad framework which could enable us to pursue the challenging goal of full, productive employment in developing countries. It revisits the conceptual foundations of full employment, and carefully examines the issue of suitable indicators for monitoring progress. The book also examines the challenges created by globalized production chains, and labour market fluctuations caused by economic crises. This book throws light on a major lacuna in development thinking on how the challenge of creating productive employment for all in developing countries needs to be addressed. It provides a solution by re-examining relevant theories and empirical evidence and by bringing out their implications for development strategies and policies. Finally, the focus falls on the effective implementation of employment strategies and policies. This authoritative work will appeal to a diverse readership of academic researchers, think-tanks, international organizations, and development partners. 1. Introduction. 2. Structural Transformation and Employment. 3. Conceptualizing the Goal of Full Employment and the SDG Framework. 4. Labour Market Outcomes and Inclusive Development. 5. Economic Fluctuations and Vulnerability of Labour Markets. 6. Has Employment Intensive Growth Become History? 7. Globalization of Production and Employment: Is Race to the Bottom Inevitable? 8. Re-thinking Development Strategies and Policies for Productive Employment. 9. Implementation of Employment Strategies and Policies. 10. Concluding Observations. Rizwanul Islam is former Special Adviser in the Employment Sector at the International Labour Organization, Switzerland.